Morphogenetic cycle of hair follicle in mammalians is sophisticated self-regulated system that is controlled by coordinated activity of diverse signaling pathways and gene regulatory networks. Determining gene networks necessary for initiation and termination cyclic hair development is key task in this area of research. 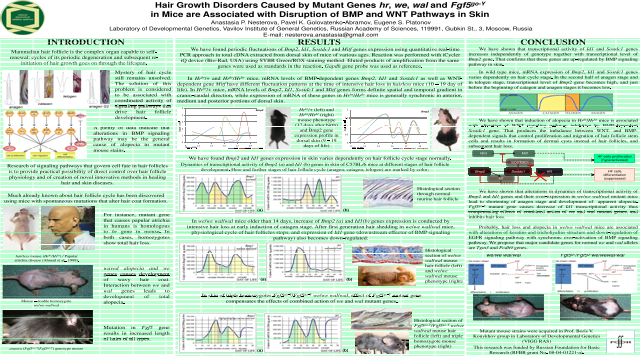 Ability of direct enhancement or suppression of hair growth depends on the solution of this task. Mutant alleles that cause various alterations in hair coat formation in mices are convenient tool for exploring activity of gene regulatory networks. In skin of C57Bl6 wild-type mice, elevation of BMP-dependent Sostdc1 gene mRNA expression entailed downregulation of WNT-dependent Mitf gene mRNA expression. In skin of Hrhr/Hrhr mutant mice, elevation of Sostdc1 mRNA expression is not associated with downregulation of WNT-dependent gene network. In skin of wild-type mice, BMP gene network retains high activity level at the end of catagen/beginning of telogen stage, and in the middle of anagen stage of hair cycle. In mutant we/we wal/wal mice, expression of BMP-associated Bmp2 and Id1 genes was increased, as compared to wild-type mice probes. Mutant Fgf5go-Y gene partially normalizes BMP gene network activity in Fgf5go-Y/Fgf5go-Y we/we wal/wal genotype mice.